JayWalk - All Your Xmms Are Belong To Me: Dude, Where My Aircraft Carrier? 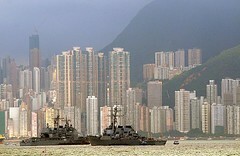 As a result of the approaching Typhoon FengShen, the Reagan Strike Carrier group departed Hong Kong a day earlier than schedule, thereby leaving behind 100 sailors behind. Yup, I can see these 100 sailors doing high-fives to each other as that means that they get to stay on Hong Kong shores for a few more days until the carrier strike group figure where they are headed next and all the necessary flight arrangements to fly the laggards back. Oh and did I mention that the meals and lodging in the interim will be on Uncle Sam's tab? High Fives all round again! 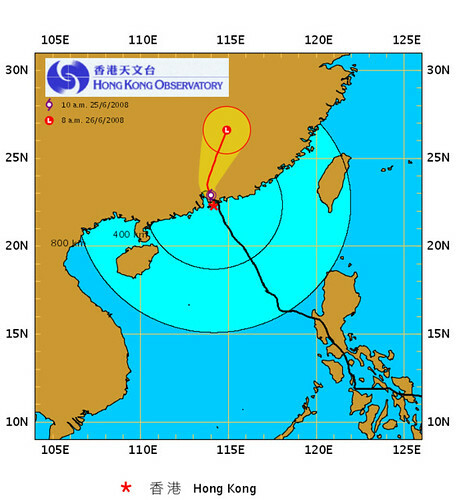 Anyway, I am in the middle of the typhoon as we speak as according to HK Observatory the typhoon passed us at around 8 am this morning. Compared to the previous encounter, this typhoon is significantly weaker as we only had Yellow Rain Alert hoisted this morning. I was able to get to work today with relative ease as there was no flooding nor traffic incidents en route. Typhoon FengShen has been around for quite some time already appearing from the South-east of the Philippines archipelago. I supposed as it cuts through the islands, the intensity is significantly reduces as typhoons is an ocean based natural phenomenon. AFTERNOTE: Well, I was totally wrong on that count as the rain at the time of the entry wasn't as heavy as I expected was due to the fact that the typhoon hadn't arrived yet. The forecast said that we were going to be hit at around 8am in the morning when in actual fact we are feeling the full impact at around 4pm later in the afternoon. And that brings us to the disaster that I want to show you guys. A ferry carrying more than 800 passengers went down into the sea is a mere 15 minutes. If the movie Titanic was 3 hours and 14 minutes, this ferry went down before the movie's opening credits was completed. Rescue efforts were severely hampered due to the bad weather despite the ship barely 500 yards away from the shore. So far only 50 survivors were found, the rest are feared dead. Relatives of the victims are questioning how the ship was allowed to sail on its 20-hour voyage. Newsreel from Associated Press available below via Youtube. Titanic was almost a century ago. what puzzles me is that, now with 21st century technology, how did the ferry company missed the typhoon alert? do they even have one? spiller: I don't think they missed it. I think they pushed forward with the sailing so as to avoid revenue loss. No explanation were made. Ridiculous. THB: I supposed they are not offering any comments until the investigations are completed.